The bicentenary of a neglected and uniquely-individual Irish composer will be celebrated on March 11th 2012. And, on the day, Waterford city will honour the birth of one of its most famous sons. William Vincent Wallace (1812-1865) was a most extraordinary musician and personality whose life story is the stuff of movies. But, over time his memory has sadly faded. If known at all nowadays it is as the composer of the once-famous opera Maritana. In his day, he was also a great virtuoso on both the violin and piano, and an intrepid adventurer. Wallace visited parts of the world that no other Irish musician had set foot in and he was widely regarded as the first great instrumentalist to visit Australia, leaving an indelible mark on the early development of Australian music. While in America, he became an impresario and took part in the inaugural concert of the New York Philharmonic Orchestra. Wallace’s gift for melody pervades all his work, and his operas like those of fellow-Irishman Michael William Balfe, are very unjustly neglected. The National Library of Ireland holds a collection of Wallace’s drawing-room music, mostly songs and piano music including a rare and fabulously ornate album dated 1854. Dedicated to ‘The Ladies of the United States’, the volume was published by William Hall and Son, 239 Broadway, New York. Coincidentally, Wallace became an American citizen in the same year. 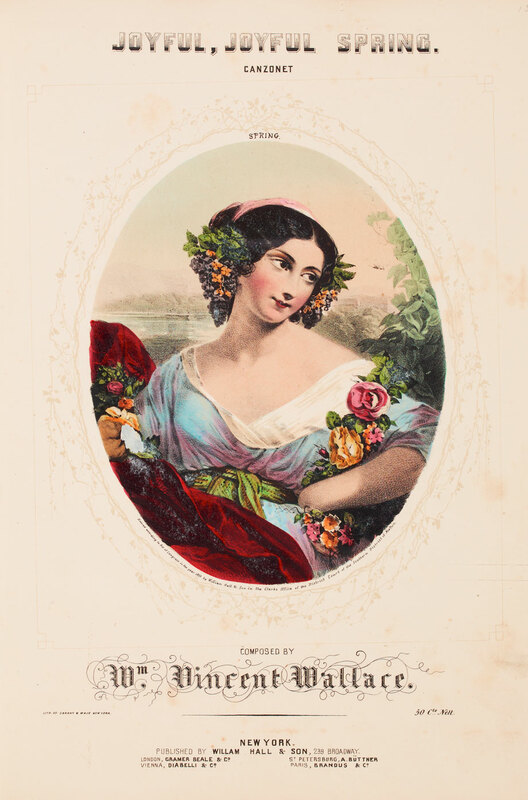 The volume is sumptuously embellished with very fine lithographs produced by Sarony & Major, coloured by Spearing and Stutzman in the United States. A facsimile album with an accompanying CD produced by RTÉ Lyric fm will be published as a commemorative edition in Autumn 2012. So, watch out for the up-coming information detailed on the RTÉ Lyric fm website. The publication has been generously sponsored by the Department of Arts, Heritage and the Gaeltacht to encourage greater awareness of Wallace’s music both in Ireland and around the world. its not on Amazon or Concert Hall. Hello Liam. I’m not sure about shops, but you can certainly buy it online from the RTÉ Shop. Congratulations to all concerned and looking forward to more Wallace and other Irish composers and their works being highlighted and made available as a follow on from this initiative. Mr Wallace is having a well-remembered birthyear. Hurrah! My bedside book (just finished) is Andrew Lamb’s outstanding new biography of wandering Willie, we now have LURLINE on disc and awareness of him and his work seems to be growing just a tad. Bravo to all who are helping that to happen! Well done, Una. Thank you for sharing this. 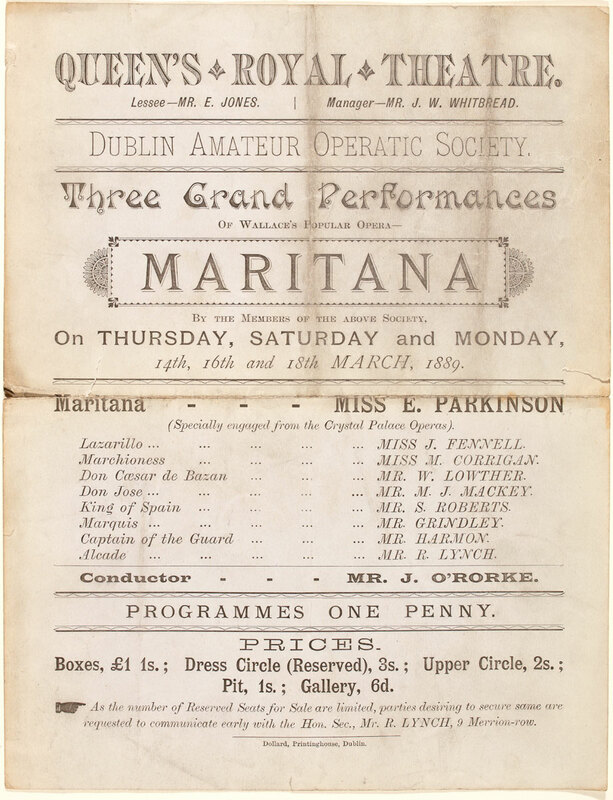 I have a copy of the score Maritana belonging to my mother who, during the 1920s and 30s, was a member of Miss McKeogh’s Opera Company – a local amateur company which operated in Drogheda. There were a number of local opera companies during this period and Wallace’s opera was obviously popular in local opera prior to 1950. In 1889, Robert O’Dwyer (or Rober Dwyer as he was then) staged and conducted Maritana with the Bristol Operatic Society. It was this experience which led him to leave his job as a church musician and seek musical fame as a singer, repetiteur and conductor with various touring opera companies. Dwyer was obviously seen as a specialist in works by Wallace and Balfe and, in the Rousbey Opera Company, he seems to have been the preferred conductor to the more famous Eugene Goossens junior. There are records of Dwyer’s Dublin performances of Maritana during the late 19th century. Interesting connections. Well done, Una. Thank you Una for this initiative. When your mail arrived I was actually strolling through the spa area of Wiesbaden and thinking of Wallace who spent several months there around 1860 curing himself (futile, as it were) and working on his ‘Amber Witch’ opera. A nice coincidence. Congratulations and thanks to Dr Una Hunt and to the National Library for marking the Wallace bicentenery. The need for a permanent home for the study and performance of the works of the Irish composers could not be better evidenced. Happy belated birthday, William Vincent Wallace! The “Tales of a Traveled Piano” hopes to continue to celebrate your music and that of many of your unduly neglected compatriots. My students really enjoy your songs! Well done Una for your tireless efforts on behalf of our Irish classical music ambassadors. I am looking forward to the day when your music, Wallace and that of other Irish classical composers will be on many lips both old and young again. In the meantime, I shall continue to sing your songs all over the world. Congratulations to the NLI Staff and Dr. Una Hunt for the launch of this Wallace BLOG1 Great job. General comment: More visibility is needed for Irish born composers including such great musicians as Michael W. Balfe, John Field and George A. Osborne and others who made their mark internationally as important composers. The Wallace BLOG is a good start. Let’s create some more on Ireland’s early pioneering composers who paved the way for all those who followed. Thank you so much for your ongoing efforts to revive interest in forgotten Irish composers, Una. What a wealth of songs William Wallace has left and with such a colourful past to accompany them. I look forward to including them in future programmes. A Happy Birthday to William Wallace. James Joyce in ‘The Dead’ uses song and instrumental music throughout the story to accompany the narrative with a special emotional landscape. Joyce being an accomplished singer himself was in command of a sizeable repetoire of songs and he includes a reference to Wallace’s ‘ Let me like a Soldier fall’ during the dinner table speech of Mr Browne. ‘ He told too of how the top gallery of the old Royal used to be packed night after night, of how one night an Italian tenor had sung five encores of ‘Let me like a Soldier Fall’ introducing a high C every time’. Maritana like the Bohemian Girl was a great hit in its time. So. let us raise a glass and toast William Wallace. Michael Holohan, composer and member of Aosdana. A wonderful tribute to this important Irish musical adventurer. Thank you. I attempted to make reference to as many of Walace’s activities in the United States as possible in RIPM (Inventory of the Periodical Press or Répertoire internationale de la presse musicale). Many of his hitherto unknown compositions and activities as a performing musician are to be found in this resource. 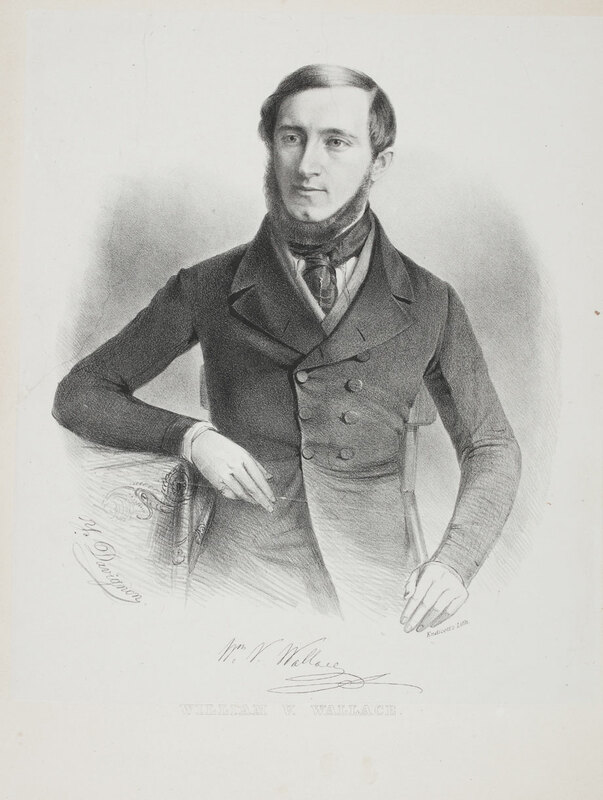 Willam Vincent Wallace was much more than the composer of the popular opera ‘Maritana’, as can be seen from the collection of his music in the National Library of Ireland. The American connection is most intriguing, and the acquisition of the rare volume, ‘Dedicated to the Ladies of the United States’, is a timely addition to the treasures of the NLI in the year of his bi- centenary. There is tremendous potential in the collection for inclusion of Wallace’s music in the NLI Digitisation project. His life and travels read like a Hollywood blockbuster, and the music of the Waterford composer deserves to be promoted and performed worldwide. What an interesting blog. I look forward to hearing the cd. Thank you Una! Congrats Una on your excellent work in keeping the flame alive. Happy birthday Mr Wallace. Happy birthday, Mr Wallace! Great to see a neglected Irish composer being remembered in this way. And he is only one of many who also deserve to have their music remembered and played. There are three of Wallace’s sheet music pieces on the NAIC website http://naic.ie/ They are; “The Harp that once through Tara’s Halls, and Fly not yet” (a performance of which by Una herself is also on the site), ” Kate Kearney, and Tow Row Row” and “Go where Glory waits thee and Love’s Young Dream”. A real treat! How right you are in acknowledging how neglected the works of WV Wallace are. How nice to see his birth and talent marked with this informative blog and the facsimile album and accompanying CD produced by RTÉ Lyric fm . Well done Dr Hunt. Happy Birthday, Mr Wallace! There is something folorn (and perhaps also significant) in the muted celebration which the anniversaries of Irish composers receive, and the bicentenary of Wallace reminds us of how much music from the ninteenth century deserves our attention. Wallace and Balfe transformed the English operatic stage, and their achievement is one compelling reason why the history of music in Ireland is so intimately bound up with the history of music in England. Buty today belongs to Wallace alone, and it is good to see it marked in this way (all our best thanks to Una Hunt in that regard). Likewise, the appearance of a new biography of Wallace by Andrew Lamb should help to revive interest in Wallace’s work (and extraordinary life). We need to reclaim him, and to do that, we need to reclaim the place of opera in Irish life! RTECO’s production of Wallace’s ‘Maritana’ at the RDS a few years ago was a real tribute to his quality as a composer. A stellar cast under the baton of Prionnsias O Duinn. It was surprising to spot so many familiar songs from the work- Wallace has made his way into the Irish consciousness very subtly through classics such as ‘Scenes that are brightest’. Congratulations today – March11th. 2012 -to William Vincent Wallace on his bicentenary. Wonderful iimages and details above from Dr. Una Hunt about his work, which needs to be more widely celebrated . Miriam Gallagher (playwright) is the author of “Bohemians”, a theatrical/musical Interlude celebrating Wallace & Balfe, which was performed at NCH and in Garter Lane Theatre, Waterford. Her radio play “Wallace” was commissioned and broadcast by Rté. How good to come across this elegant page on WVW. He is too neglected both in Ireland and England. His music needs to be heard and his operas played. 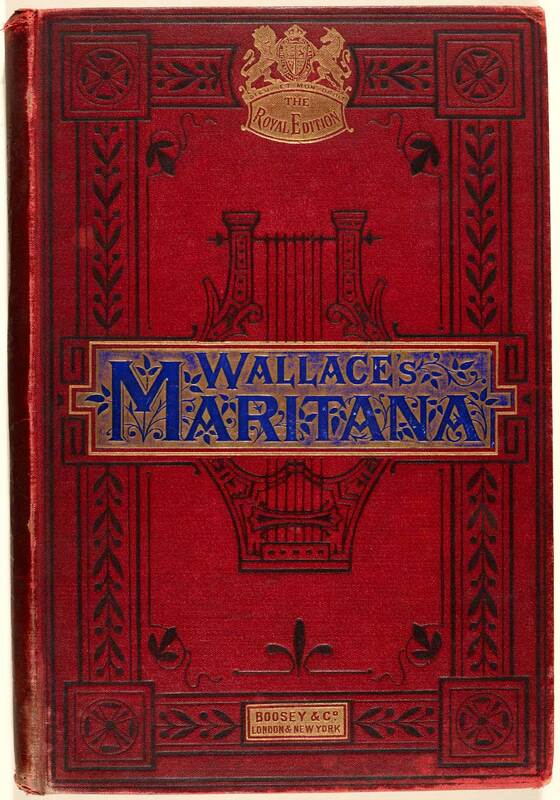 Thank you for the excellent piece on W.V.Wallace.My introduction to him came when my school (Coláiste Iognáid,Galway) produced Maritana in 1952,with songs and libretto entirely in Irish! The translation must have been the work of one of the Jesuit Fathers. I was immediately captivated by the glorious melodies.A year or two later,the enterprising Patrician Musical Society in Galway also produced the same opera.